Pistol-caliber carbines: they’re not pistols, but they’re not quite rifles either. Some people might tell you that they’re rifle-wannabes that are unnecessary and impractical, but I think pistol-caliber carbines are optimized for self-defense, competition, and FUN. Pistol-caliber carbines are a great home defense option…and they’re just plain fun. We’re going to look particularly at pistol-caliber carbines for self-defense…particularly at home where these things really shine. Plus some basics and layout just what a pistol caliber carbine is…and why you might want one. 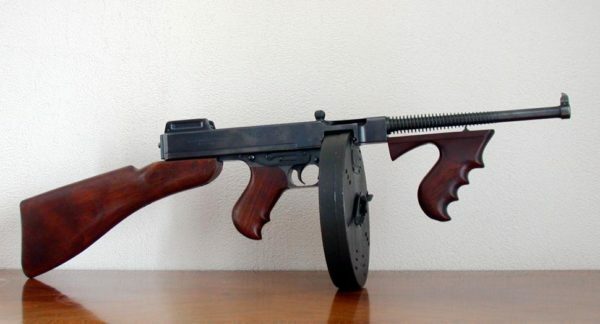 The Tommy Gun: a .45 ACP submachine gun that’s the granddaddy of modern carbines. 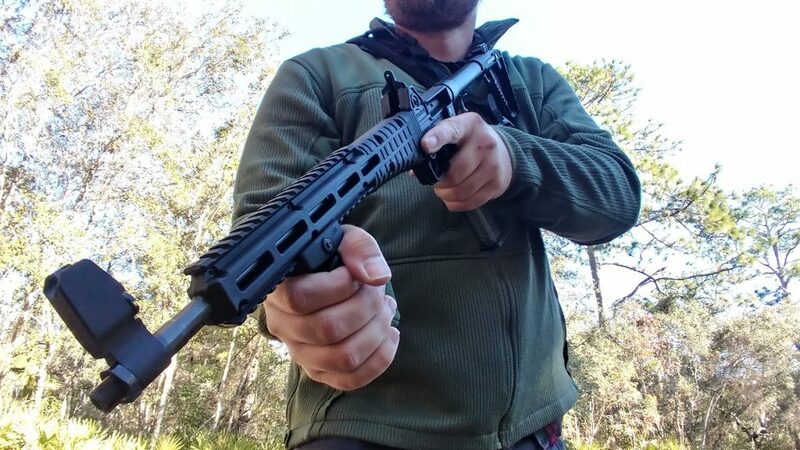 If you need a home defense gun that will be used primarily in open space to secure perimeters and neutralize threats outdoors, the AR-15 and AK-47 are great choices. However, indoor home defense scenarios are a little different. You want a gun that’s smaller and allows for maneuverability in tight areas, like around doorways and down hallways. Most pistol caliber carbines are going to be shorter than any long gun, save maybe some of the nice bullpup shotguns and rifles out there. Simply put, you don’t want to lug around a bulky rifle or shotgun if you’re moving through a confined space. In addition, when comparing a pistol-caliber carbine specifically to the AK-47, you also get an added benefit of lower recoil. The biggest advantage that the pistol-caliber carbine has over your sidearm is stability. Some of you may be crack shots who can shoot the wings off a fly with your trusty pistol. For the rest of us, handgun accuracy tends to drop when shooting at a target from 15 – 25 yards away, especially in dangerous situations where adrenaline and stress levels are through the roof. More rounds on tap and more stability means that you’ll be way better off with a PCC than a handgun in most high-stress situations. For these types of scenarios, pistol-caliber carbines give you that added stability to hit your mid-range target with more accuracy. Another benefit of pistol-caliber carbines is that many of them are designed to work interchangeably with some of your favorite handguns, so you can use the same magazine for your Cx4 Storm as you can for your Beretta 92. 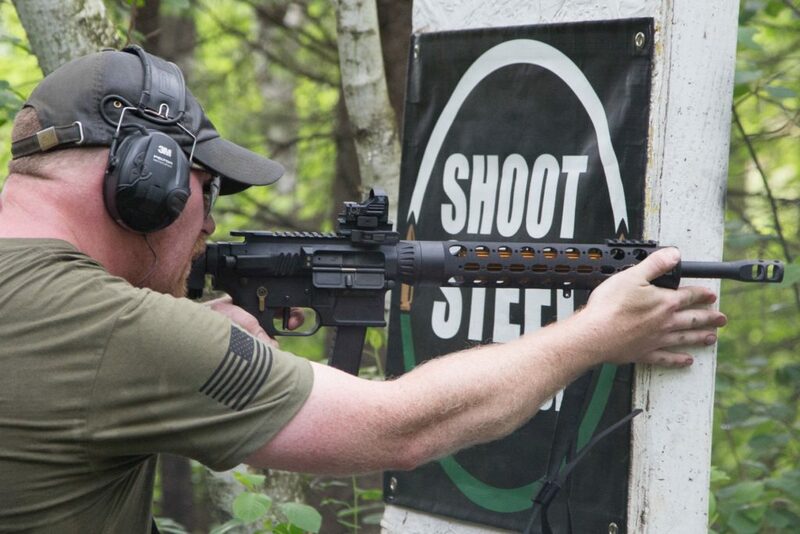 Check out this video of how to shoot pistol-caliber carbines in a home defense situation. Many PCCs also take OEM and aftermarket Glock mags, making them a good choice for shooters who already carry Gaston’s Greatest anyway and might have a few extra mags around the house. There are some great home defense shotguns out there, but a shotgun might not always be the best option. The average pistol-caliber carbine shoots either 9mm, .40 S&W cartridges, or .45 ACP, and less common are .380 and .357 magnum cartridges. The benefit to this is that you’ll find no shortage of ammo and in most cases, your pistol-caliber carbine is more affordable to shoot than the average rifle. 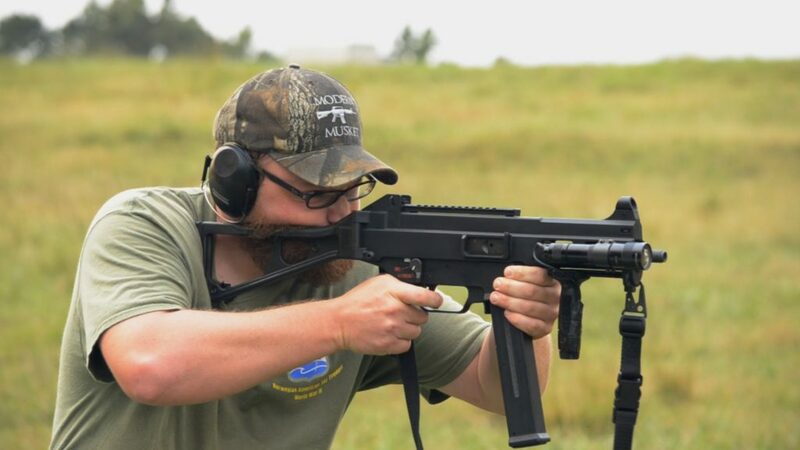 There are a number of pistol caliber carbine competitions out there as well if you choose to get competitive with things. Now that we’ve covered some of the basics about pistol-caliber carbines, let’s have a look at some popular carbine models. First up, is a doozie, but hang in here with me for a second. We’re going to get the controversial one out of the way up front. It’s a Hi-Point. 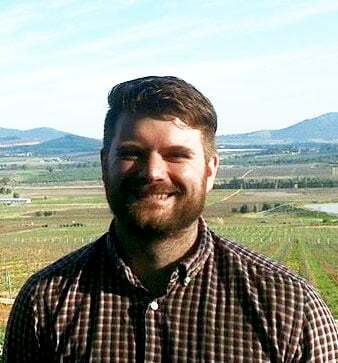 We know what that name means, and we know its not exactly a byword for quality. All the same, it’s on the list. The Hi-Point 995TS ($350 -$480) is a 9mm carbine that many shooters call one of the best budget PCCs around. It’s sleek, reliable, surprisingly accurate given its price (and lineage) and weighs in at just 6.25 pounds. Its tactical design gives the gun a menacing look while its size and weight make it comfortable to shoot. In fact, many Hi-Point users report that the 995TS is much more comfortable to shoot than the company’s handguns, which have received criticism for being unnaturally large and blocky…and genuinely terrible. You can also customize it fairly heavily, and its relatively low price means you can use it for some pretty wild gunsmithing experiments. For whatever reason, Hi-Point did well with the 995TS. It’s far more reliable than really any other Hi-Point offering, and certainly more comfortable to shoot. Another nice feature of the 995TS is its iron sights, which are positioned high enough to make it easy to line up targets without the need of a mounted optic piece. Overall, the carbine is comfortable to shoot and has an incredible accuracy (relatively speaking), and its low retail price makes it a great carbine for beginners. The only thing holding this gun back from reaching its top potential is the Hi-Point name, which has been historically associated with cheap design and jamming malfunctions. With that said, the 995TS is a great gun to have around the house. It’s cheap to buy, cheap to maintain, and is great for the range or for dispatching the occasional varmint around the home. This one I wouldn’t necessarily recommend carrying into a life-or-death scenario…unless it’s all you have, but a Hi-Point is still better than no gun at all, and the 995TS is certainly nothing to sneeze at when it comes to protecting yourself. In particular, this bad boy makes for an excellent “truck gun”. It fits nicely in a toolbox, and is cheap enough that you can keep one in a boat when fishing…just in case. 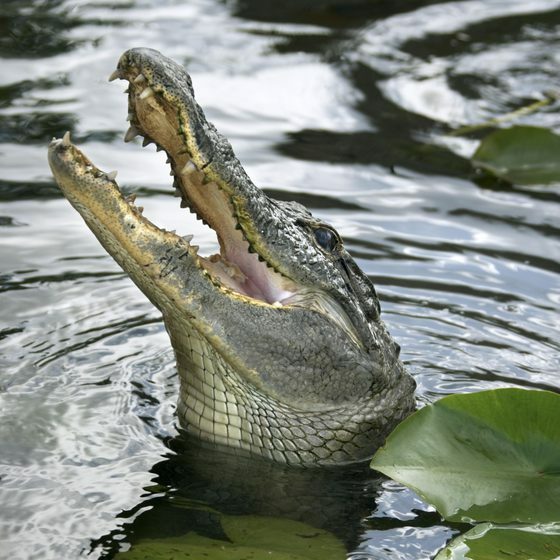 In case of gator, for instance. The Kel-Tec SUB-2000 ($400 – $500) is a semi-automatic carbine that supports 9mm or .40 S&W cartridges, depending on your caliber preferences. There’s a lot to love about the SUB-2000 carbine. For starters, before you buy the gun, you can choose which handgun magazine that you want it to take so that you can use the carbine interchangeably with your favorite sidearm. When it comes to comfort and convenience, the SUB-2000 earns a gold star. It weighs a total of 4.25 pounds without ammo and is 30.5” in length, and it can also be collapsed and stored away in a compact location. Fiber optic front sight for easily lining up targets. The bolt is located underneath the buttstock in a convenient and out-of-the-way position. Tons of aftermarket parts available. The SUB-2000 is a solid gun that combines power, accuracy, and comfort, and is a great gun for its price. Also, since it’s a Kel-Tec, you’re protected under a lifetime warranty in the event of something malfunctioning. Check out our full in-depth review. Next, we have the Cx4 Storm, a highly-acclaimed pistol-caliber carbine that is made to support the following cartridges: 9mm, .40 S&W, and the .45 ACP (recently discontinued, but there are models floating around). Like all Beretta products, the Cx4 Storm is praised for being durable, dependable, and highly accurate, as well as being ergonomically designed and able to accommodate people of all sizes. Straight out of the box, the gun is a bit basic and simplistic. You do have access to loads of aftermarket parts like vertical foregrips, flash suppressors, scopes, and flashlights or laser sights. In fact, you can turn this $700ish gun into a $2000+ project on upgrades alone if you wanted to, but the benefit of the Cx4 Storm is that you don’t have to invest any money into it to enjoy a high-quality carbine. Incredibly lightweight at 5.75 pounds. More compact than most carbines with an overall length of 29.5”. Doesn’t have the cheap and flimsy feel that some of the other polymer guns on the market have. Magazines are inserted through the pistol grip, making it easier to reload in low-light or high-stress situations. Picatinny rail on the top of the stock makes it easy to mount optics. Can choose whether you want the magazines to be compatible with the Px4 or 90 series pistols, and with adaptors the Cx4 also accepts 8000-series magazines. One of the only complaints about the Cx4 Storm is the trigger. It’s plastic and many gun owners feel that its trigger pull of around 7.5 pounds is much too heavy for a carbine. Fortunately, there are aftermarket accessories available to help you reduce the trigger pull down to something around 3 – 5 pounds. 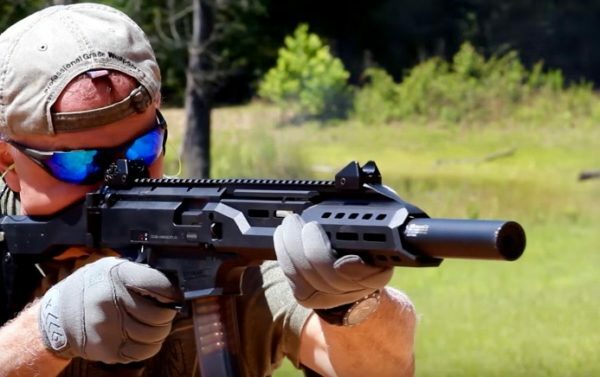 The CZ Scorpion EVO 3 ($900) is a 9mm carbine that takes CZ’s classic Scorpion machine pistol and updates it to a modern (and civilian legal) design that is sleeker, and more reliable. I’ll save some space here and just send you to our complete CZ Scorpion EVO review…suffice to say its an excellent take on a classic and it will absolutely earn its keep in a home defense scenario. Also, taking it to the range is hella fun. What’s your take? Finally, we have my personal favorite. Heckler and Koch are known for producing excellent military-grade weaponry, and the HK USC ($1500-$1800) is no exception to the rule. This thing looks great, shoots great, and is as reliable as a Swiss watch. This carbine takes .45 ACP cartridges and is the civilian version of the HK UMP, a popular submachine gun that is employed by various security forces around the world…and anyone who has ever played Call of Duty or Rainbow Six. The USC delivers stopping power, reliability, and maneuverability. Its length is under 35.5” long and weighs less than six pounds, which means that operating it in confined spaces is a breeze. Also, the gun’s molded-in mounting points make it easy to attach optics, lighting, or other devices. 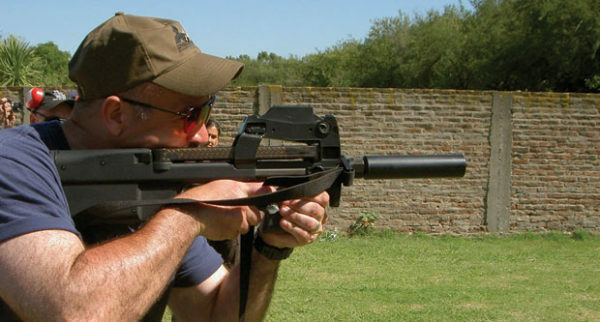 The USC has a submachine gun look and feel to it, which makes it great for home defense, and also really freaking cool. Never underestimate the value of looking cool in a tactical scenario. The USC comes with a 10-capacity magazine which is made out of the same corrosion-proof polymer as the gun. Rubber buttstock pad and cheek rest for added comfort. Gun is completely corrosion proof and comes with a lifetime warranty. 327mm sight radius for easy aiming. If you want a carbine that packs the punch that comes with a .45 ACP but is incredibly easy to shoot, the USC is right for you – and since it’s based on the UMP’s tactical design, you know that you’re getting a gun that’s been tried and tested for close to mid-range self-defense. Good luck getting your hands on the full-auto version though. 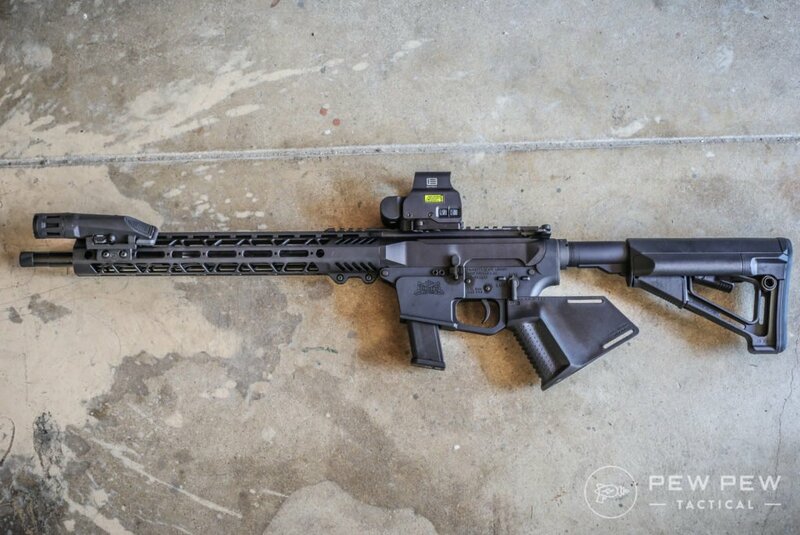 Our Editor’s Pick for an entry-level 9mm AR-15 PCC that is reliable and takes Glock mags is the PX-9. Though it doesn’t have last round bolt hold open…it gives you the familiarity of the AR platform and all the potential upgrade potential. Check it out in a night-time competition! And our full review where we deep-dive into its reliability, accuracy, and more. They’re lighter and more mobile than rifles. They fire at a higher velocity than their handgun counterparts. They’re not as loud as most rifles and handguns. 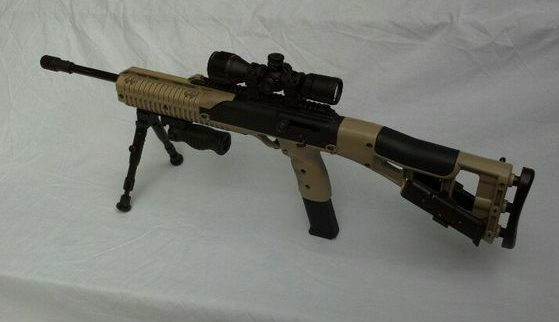 Lower recoil than most rifles with the exception of .22 caliber rifles. 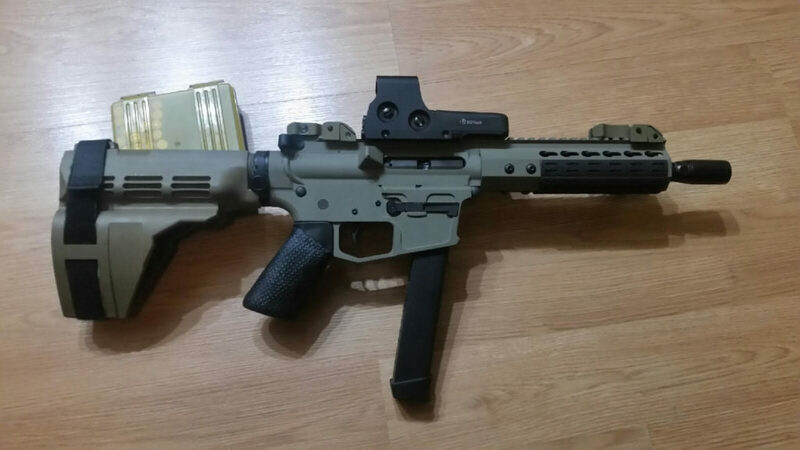 Virtually all of the same accessories that you can add to your rifles like optics, flashlights, and vertical foregrips can be mounted on your carbine. 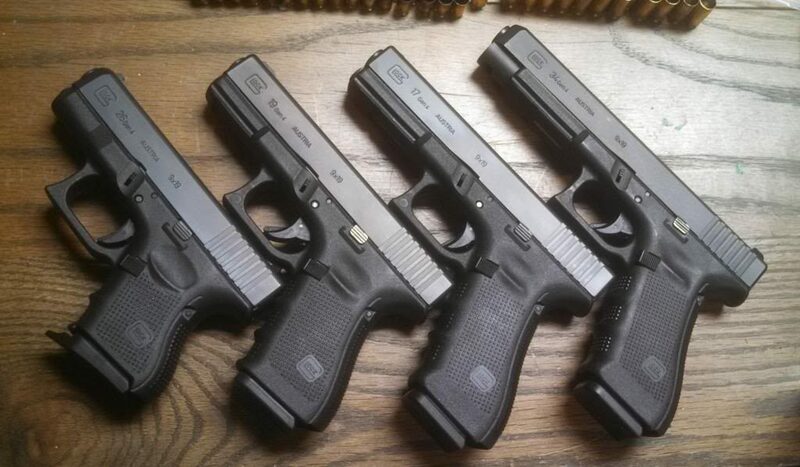 The caliber you choose depends widely on your personal preference, especially when you have to choose between a .45 ACP and a 9mm. Regardless of the caliber you go with, you’ll get much more stability and accuracy with your carbine than with a handgun. If money is a factor, remember that the 9mm ammo is significantly cheaper than .40 S&W and .45 ACP, as well as most other cartridges on the market. 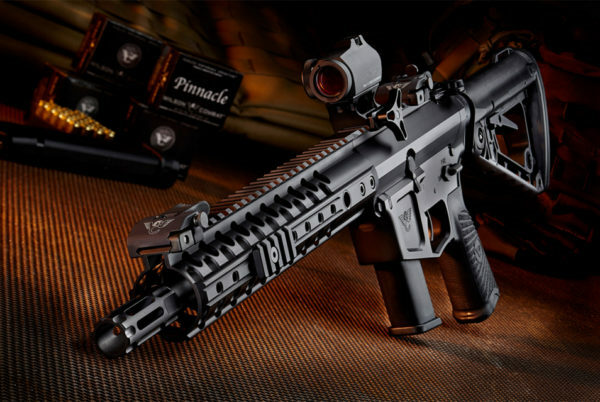 The opinions on, pistol-caliber carbines in the firearms community are mixed. Some people love them, others think they’re impractical, and a lot of people simply don’t know enough pistol-caliber carbines to make an assessment because they’re so overlooked. How can you ignore something that looks so freaking cool? Before making your decision on whether you want to buy your first carbine or not, I recommend visiting the range and trying a few out. I personally think that carbines are equally as fun to shoot as rifles and much more fun than handguns. The truth is that they’re perfect for home defense because they provide the best of both worlds: maneuverability more similar to a handgun and the stability of a rifle. Plus dang fun for competitions. If you already have experience shooting pistol-caliber carbines, what are your favorites? Know of one we missed? Want to yell at us for the blasphemy of recommending a Hi-Point? Let us know in the comments below! Then check out other favorite guns & gear in Editor’s Picks. No Ruger PC Carbine? Affordable, highly adaptable, GREAT shooter and takes both Ruger and Glock magazines plus you can customize to your heart’s content. AND it breaks down. Perfect for home protection or as a bug out gun. The Hi-Point and Kel-Tec are great guns because they are very inexpensive but still reliable. I love the design of the Beretta CX4 Storm and IMHO the Rolls Royce of PCCs would be the CZ Scorpion but after much deliberation all these guns I mentioned I went with the Ruger and I am not disappointed! How does the Freedom Ordnance FX-9 stack up the the carbine in your list?